Living in the past, holding onto grudges, and not letting go of anger can seriously affect people’s lives and overall happiness. I believe it is so important we model forgiveness to our children so they can be free of negativity and blame. Imagine how powerful it would be to learn to forgive (in a deep and meaningful way) from the early years of life… what a great pattern to get into for the long run! For this activity I found a physical example to show what it looks like when we do not forgive and how the lack of forgiveness hinders our daily life. We then used the example to describe why we should forgive, so that we are not held back. First I presented the boys with a trolley and a box of blocks. Then I asked them to think of things that made them mad or sad or frustrated, and then put a block in the trolley for each one. It was actually very interesting to hear what they came up with… such as not being allowed to buy specific toys and not being allowed to watch movies. 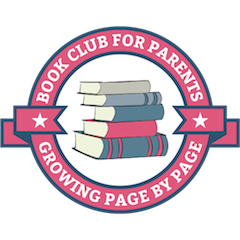 I can imagine with older children it may bring out some interesting topics that would otherwise be left to silence. I also added some examples such as when someone knocks something you are building accidentally, when someone at the playground pushes you or shouts at you, etc. Then I invited the boys to take turns walking around the house with the trolley and afterwards asked them what it was like. They said it was hard, they kept on bumping into stuff, and couldn’t go very fast. I pointed out that my two-year-old actually had to walk backwards to pull the trolley so he could only see what was behind him while going around the house (interesting metaphor for only focusing on the past instead of living in the present for us parents to think about). 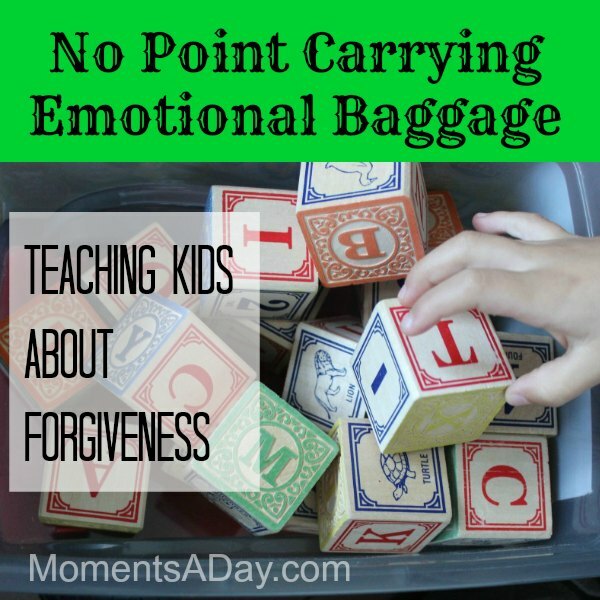 Then I explained that not forgiving and carrying around anger is like hauling around an extra bag all day, carrying stuff that is weighing us down and slowing us on our journey. When we forgive, we let go of the emotional baggage that can keep us back. Forgiveness frees our hearts and minds, and lets us live in peace. When we forgive, we can leave the whole trolley behind! Note: I also added how forgiving does not mean we do not work through our feelings (it’s okay to cry! ), or let people be unkind or unfair to us. However forgiveness lets us work through situations without negativity overtaking our emotions. Do you model forgiveness to your children? Do they know what can happen after someone says, “I’m sorry”? I had been searching for a good lesson on forgiveness and came across this one. I must say, you have done a fine job with this one. Thank you for sharing. Awesome idea! Thank you for sharing it. I’ll use it in Bible class, tomorrow! This is a great way to let them see how burdensome carrying all those grudges can be. I will definitely use this in my classroom. Thanks for sharing, I love it!! I have a question. I’m doing a week of prayer for PreK through 3rd grade and my theme is the book of Psalms. Do you know any scriptures I can use, with this illustration you have on this blog, found in the book of Psalms?